New twists, new turns, new special effects including the intreguing 'tractor beam' will have players standing in line to play Galaga. Excitingly different, Galaga is a 1 or 2 player, full color video game that also features Midway's Increase Price of Play at the Player's Option. 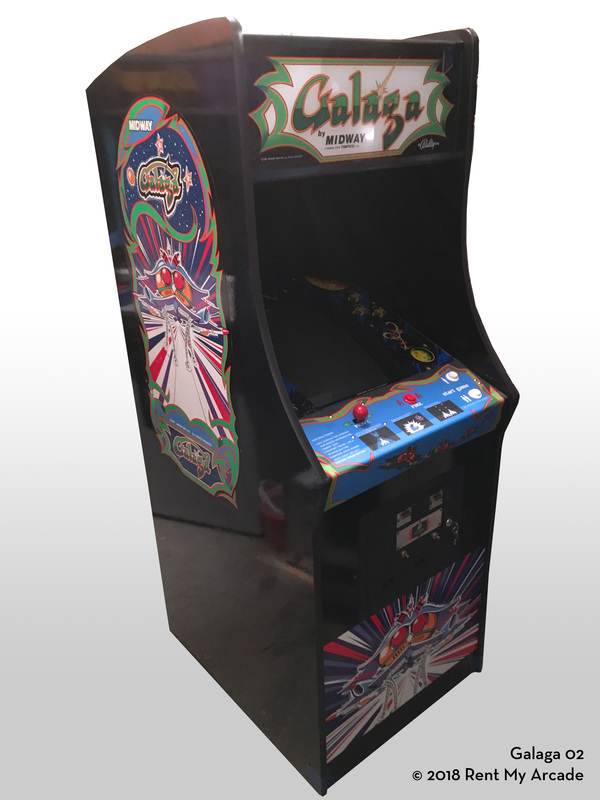 Galaga is manufactured by Mideay under license from Namco, Ltd.
New Generation Multi-Stage 1 or 2 Player Full Color Video Game! Stage 2: More points are scored for hitting attacking aliens with different values for solo, duo, or trio formations. The top line 'Boss' Galaga must be hit twice to be destyroyed. Stages 4 and on: The game continues at an increasing pas of alient attacks with more and more deadly bombs. Bonus Features: Bonus Fighters are awarded at 20,000, 70,000 and every 70,000 points thereafter. Midways 'IncreasedPrice of Play at Player's Option' enabled player to get standard number of fighters for one coin (adjustable) and double the standard number plus a bonus fighyter for two coins. Tractor Beam. A 'Boss' Galaga randomly shoots a Tractor Beam trying to capture player's fighter. Dual Fighters. If a player hits this 'Boss', the fighter descends into tandum with double firepower. Special Scoring. Indicates number of shots fired, hits, and Hit/Miss ratio to show accuracy percentage. 5 Top Scores. Player's initials programmed onto screen for all to challenge. H: 73", W: 27", D: 34"